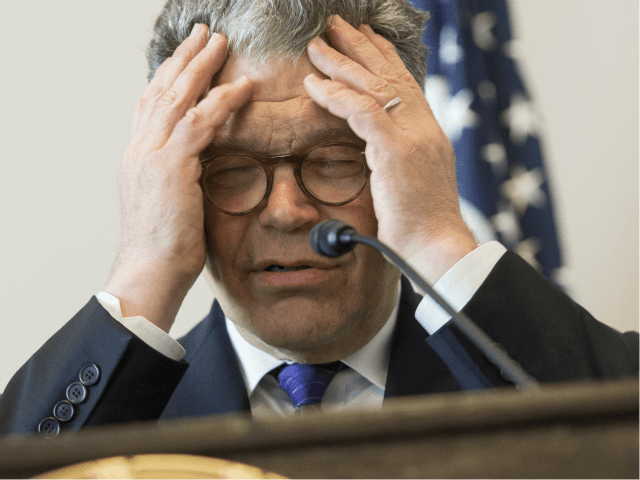 Sen. Al Franken’s (D-MN) spokesman announced that Franken would not resign despite allegations that he groped a woman’s breasts and kissed her without her consent. Sexual harassment allegations against the Minnesota senator surfaced this week after Los Angeles-based journalist Leeann Tweeden accused Franken of fondling her breasts while she was sleeping and aggressively shoving his tongue down her throat. Franken, who had not worked in politics at the time, had apparently traveled with the woman on a USO tour overseas in 2006 when the alleged incident took place. The December 2006 photo that depicted Franken fondling Tweeden’s breasts surfaced shortly after Tweeden went public with her story, fueling the allegations against the Minnesota senator. Franken verified that the photo was accurate after it surfaced and apologized for taking the picture with her. In an updated statement, he apologized to Tweeden and everyone he has ever worked with or represented. “The first thing I want to do is apologize: to Leeann, to everyone else who was part of that tour, to everyone who has worked for me, to everyone I represent, and to everyone who counts on me to be an ally and supporter and champion of women,” Franken said. Tweeden responded by accepting Franken’s apology. A second woman also accused Franken of harassment this week, claiming that the senator followed her and repeatedly called her home phone number. As allegations against the Minnesota Democrat grew and several senators requested an investigation into Franken’s conduct, Franken called for a Senate ethics investigation into his behavior.